Generates a defocused version of the source clip using a 'circle of confusion' convolution. 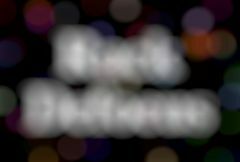 This effect is often preferable to a gaussian blur for simulating a real defocused camera lens, because bright spots can be defocused into clean shapes instead of being smoothed away. The iris shape can be controlled using Points, Pointiness and Rotate, and the Use Gamma parameter can adjust the relative brightness of the blurred highlights. Defocus Width: Default: 0.1, Range: 0 or greater, Shared . The width of the defocus. This parameter can be adjusted using the Width Widget. Rel Height: Default: 1, Range: 0.01 or greater, Shared . The relative height of the iris shape. If it is not 1, circles become ellipses, etc. Gauss Blur: Default: 0, Range: 0 or greater, Shared . If positive, a gaussian blur is also applied which smooths out the edges of the shapes. This might also darken the highlights because Gamma is not considered in the gaussian blur. Use Gamma: Default: 1, Range: 0.1 or greater, Shared . Values above 1 cause highlights in the source clip to keep their brightness after the defocus is applied. Boost Highlights: Default: 0, Range: 0 or greater, Shared . The amount to increase the luma of the highlights in the source clip. Increase this parameter to blow out the highlights without affecting the darks or mid-tones. Hilite Threshold: Default: 0.9, Range: 0 or greater, Shared . The minimum luma value for highlights. Pixels brighter than this will be brightened according to the Boost Highlights parameter. Shape: Popup menu, Default: Circle . Determines the shape of the simulated camera iris. Roundness: Default: 0, Range: any, Shared . Modifies the shape of the simulated camera iris. A value of 1 produces a circle; 0 gives a flat-sided polygon with a number of sides given by the Shape parameter. Less than 0 causes the sides to squeeze inward giving a star shape, while a value greater than 1 causes the corners to squeeze inward, giving a flowery shape. Has no effect if the Shape is set to Circle. Rotate: Default: 0, Range: any, Shared . Bokeh: Default: 0, Range: any, Shared . Softens the outer edge of the iris shape, which gives a softer look to the defocused highlights. A negative value darkens the center of the iris shape, producing a ring-like defocus shape. Scale Result: Default: 1, Range: 0 or greater, Shared . Edge Mode: Popup menu, Default: Reflect . Determines the behavior when accessing areas outside the source image. Black: Areas outside the source image are treated as black, which can produce dark areas around the edges of the image. Select this for fastest rendering. Repeat: Repeats the last pixel outside the border of the image. Reflect: Reflects the image outside the border. Interpolates between the defocused result and the original source. Set this to 1 for the original source. Show Shape: Check-box, Default: off, Shared . Show the iris shape instead of the defocused image. Lens Noise: Default: 0, Range: 0 or greater, Shared . Increase to add noise to the iris shape, dirtying up the defocus a little. Can make the result more realistic. Turn up past 1 for a more stylistic result. Noise Freq: Default: 40, Range: 0.01 or greater, Shared . The frequency of the added noise. Ignored if Lens Noise is zero. Noise Freq Rel X: Default: 1, Range: 0.01 or greater, Shared . The relative horizontal frequency of the added iris noise. Increase to stretch it vertically or decrease to stretch it horizontally. Noise Seed: Default: 0.123, Range: 0 or greater, Shared . The seed value for the added noise. To make the noise appear different on each frame, animate this to be different on each frame. The actual value doesn't matter; only that it's different. Chroma Distort: Default: 0, Range: any, Shared . Adds some chromatic aberration around the edges of the image; red and blue wavelengths of light refract differently in real lenses, producing fringes of color where the rays strike the lens at oblique angles. Color Fringing: Default: 0, Range: any, Shared . Color Fringing produces rings of color around every object in the image by varying the focal distance for each color channel. It gives a different style of chromatic aberration from Chroma Distort because it's not just in the image corners.